NGC 6960. 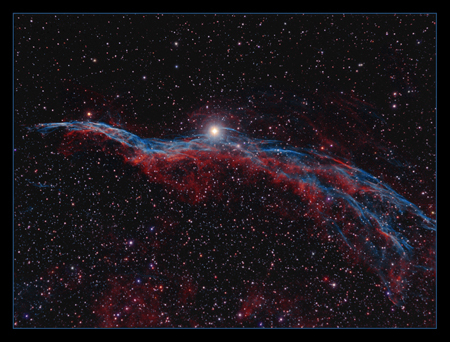 The 'Witches Broom' or 'Western Veil' section of the Veil Nebula complex. The aptly named 'Witches Broom' is part of the remains of a star that went supernova between 5 and 8000 years ago and can be found in the constellation of Cygnus. The bright star in the centre is 52 cygni, a naked eye star in reasonable conditions, so it's quite easy to find this nebula, although it's quite faint. As so many well known objects were, it was discovered by William Herschel, on the 5th September 1784. The image is a combination of narrowband data for the nebula, and RGB for the stars. Ha alpha was used for red, OIII for blue, and a 50/50 mix of Ha and OIII for green. The Ha/OIII was also used as a luminance layer for the nebula, although only at 50% opacity. Data was obtained over several sessions from July to September 2011 from Weymouth, Dorset. RGB ( 16 of each). Red @ 40s, Green @ 30s, Blue @ 50s. Total imaging time. 11 hrs 22 minutes.